It’s Time to Play, Stay, Dine and Save! Kick-start the new year by making incredible memories together in the middle of the magic. 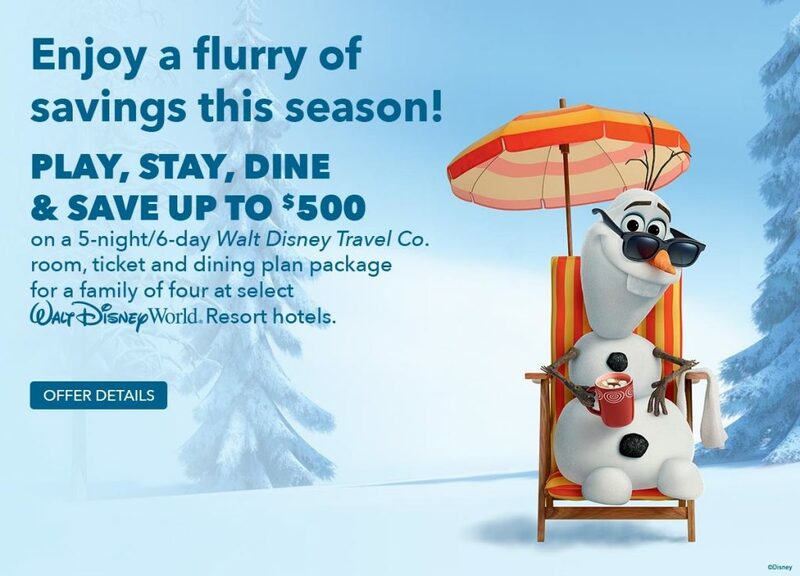 Play, stay, dine and save up to $500 on a 5-night/6-day room, Magic Your Way base ticket and dining plan package for a family of 4 at select Disney Resort hotels. This special offer is valid at select Disney Resort hotels for arrivals most nights from January 1 through March 10, 2018 when you book now through December 22, 2017. The number of rooms allocated for this offer is limited. Savings based on a non-discounted price for the same package. Everyone in the same room must be on the same package.Tickets and options must be used within 14 days of first use. First use must occur on or before December 31, 2018. Some table-service restaurants may have limited or no availability at time of package purchase. Must book through December 22, 2017 to receive this promotion. Promotion based on availability. Availability is limited, so get a quote today! « BIG ANNOUNCEMENT – Let’s Adventure Travel!